Panasonic TX-55EZ952B OLED - Plasma Is Dead Long Live OLED! John and I have both been eagerly awaiting a new TV which would persuade us to upgrade our now ageing Pioneer plasma screens. The new Panasonic TX-55EZ952B OLED precisely fits the bill. This high end 4K Pro HDR TV is Hollywood tuned and equipped with Studio Colour HCX2 and THX certified processing to produce a full, rich and natural spectrum of colours. The multiple HDR formats supported include Hybrid Log Gamma, the broadcast HDR format jointly developed by the BBC and Japan's NHK. Panasonic have fully utilised their plasma experience to great effect with this TV, ensuring it is capable of incredible shadow detail and displaying the deepest blacks. 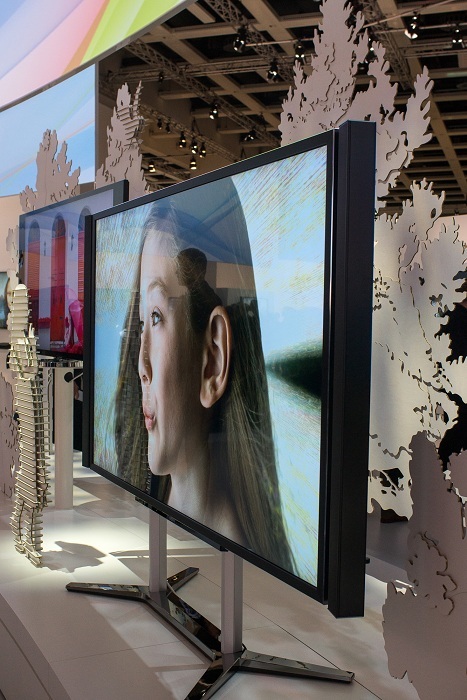 These positive plasma attributes are enhanced by the many advantages of OLEDs such as higher brightness, natural colour rendering, much lower power consumption and elegant slimline design. The high specification includes all iPlayers, Freeview Play, inbuilt Netflix and Amazon 4K. The supplied compact central stand avoids the cabinet overhang issues of many TVs and we both appreciated the ease with which we wall mounted our demo screen. It was far less stressful than the back breaking task we recall with our Pioneer plasmas many years ago! 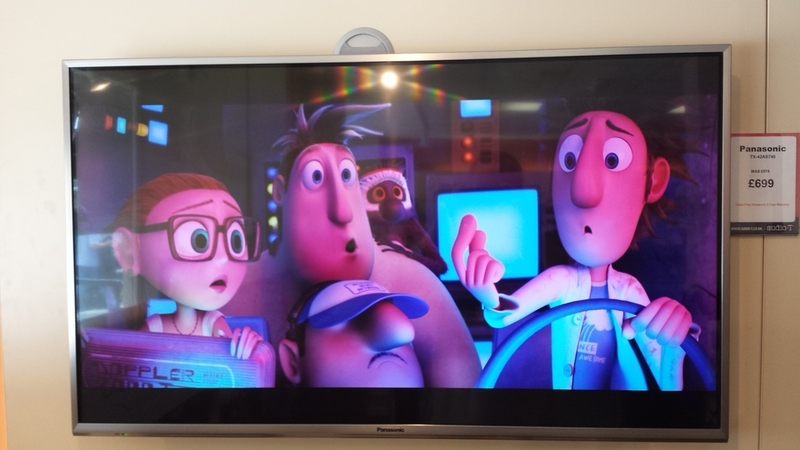 Just phone or email to book or just call in to see the Panasonic TX-55EZ952B OLED with an awesome home cinema system in our Dolby Atmos equipped demonstration room. We are sure you will be as impressed as we are with this brilliant TV! Panasonic TVs are available from all branches of Audio T.
On Friday the 20th and Saturday the 21st of November Audio T Cardiff are hosting an event to show off the new Panasonic TX-65CZ952B 65 inch OLED TV paired with the Pioneer LX89 DolbyAtmos receiver! Panasonic TX42AS600 A 42" LCD with Smart functionality, Freetime, Swipe and Share all for £499. Panasonic TX40AX630 A 40" 4K Ultra HD LCD. Freetime, Smart Functionality plus much, much more. £699! Panasonic TX42AS740 Better picture quality than the 600/630 and 650 models, Freetime, Passive 3D. £699! Panasonic TX60AS650 For those who require a large TV for a truly cinematic experience. Freetime, Smart functionality, Passive 3D £1599. Grab yourself one of the last great plasma tv's produced by Panasonic. Panasonic TX-P65VT65B Full HD 65" 3D Plasma TV. Our demo unit has no marks or scratches on it and is only ever turned on for quick demonstrations so there are very little hours clocked up on the set. Come along and take a look at the one of the last of the great plasmas. Sony & Audio T can give you four thousand reasons for you to pop along to the Swindon branch with the new Sony KD-55X9005 4K ultra HD TV screen. 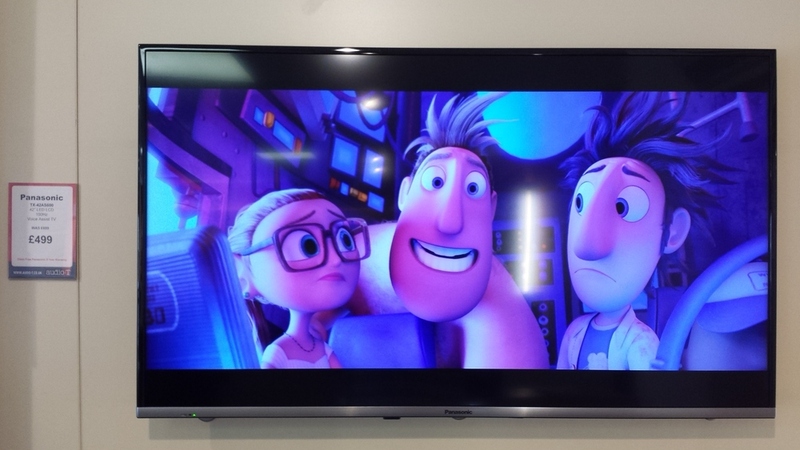 At Audio T Swindon, we are pleased to be the only dealer in town who can show off the amazing capabilities of this Sony 4K screen, giving you four times the resolution of standard HD TV! With its stunning rich colour palette and great depth to the image, this Sony 4K LED screen truly is breath- taking.....and that's just on upscaled Blu-Ray content! 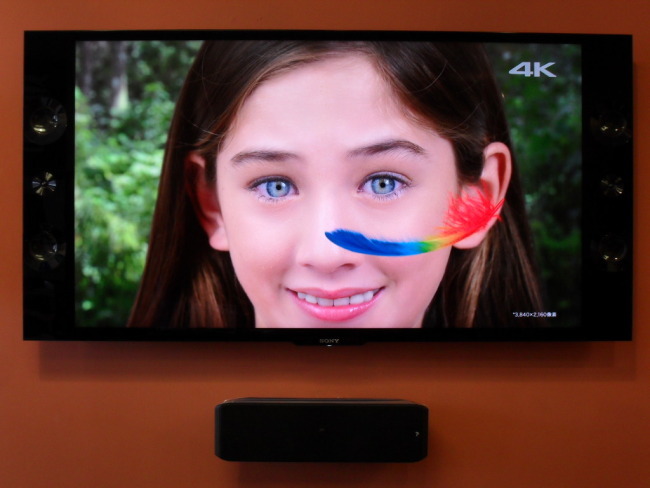 Let us show you the future of television when we demonstrate it using 4K ultra HD content from our 4K server. So if you're looking for a new TV that has great on board sound and a picture to die for then look no further and pop in to Audio T Swindon and witness for your self the future of television. You can read reviews and see videos of the Sony KD-55X9005 4K ultra HD TV screen on our website. This successful event took place on the 28th to the 30th of November. Many of our customers were amazed at the image quality of the 4K screen and the amazing sound quality produced by the high resolution audio players. 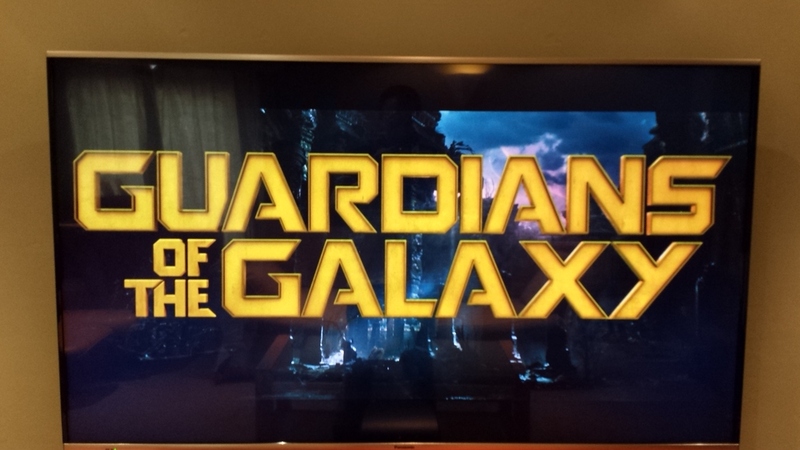 Exceptional picture quality on 4K souces and Blu-Ray discs. The TV also offers amazing sound quality from the built in magnetic fluid loudspeakers developed by NASA. Hi-Resolution audio generally refers to a format that is capable of exceeding the sampling/Bit rates of CD (44.1kHz/16Bit). An Example of this is WAV files which are capable of 96kHz/24Bit. This offers a level of performance far exceeding that capable of CD. This is a high resolution audio player. It is not a streamer - each time music is downloaded to the HAP-S1 it is backed up onto its own hard drive. Therefore music play back is instantaneous as there is no need to wait for the network to stream the tracks. This also makes the unit stand alone as once the files are transfered to the HAP-S1 there is no need to have the PC, etc, on. The HAP-S1 includes a high quality 40W amplifier, built in D/A convertor and a 500GB HDD. (This is expandable via the USB port on the rear of the product). There is no amplifier in the HAPZ1ES. Due to the quality obtained a seperate high qualty amplifier is recommended. The HAPz1ES includes a unique DSD remastering engine. This enables standard music files such as MP3, AAC & WAV to be converted to DSD files. A very high quality DAC is integated within the unit. This uses FIR filters taht are ideal for the conversion of DSD files. The unit has a 1Tb HDD that is expandable via the rear USB port. 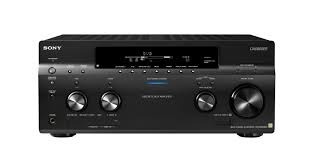 Exceptional built quality renown in the Sony ES range. This is an analogue two channel stereo amplifier designed to partner the HAP-Z1ES. It is the first two channel amplifier designed by Sony since the EA777ES 14 years ago. The amplifier is an 80W push pull design and offers multiple analogue inputs and a balanced input. The UDA-1S is a high quality DAC designed to except digital inputs from a variaety of sources including CD Players, Computers, Smart phones, etc. It is capable of decoding signals up to 192kHz 32 Bit. It has a built in 23W analogue amplifier so it can be connected directly to a high quality pair of loudspeakers. Designed to compliment the Sony High resolution products such as the HAP-S1 and the UDA-1. 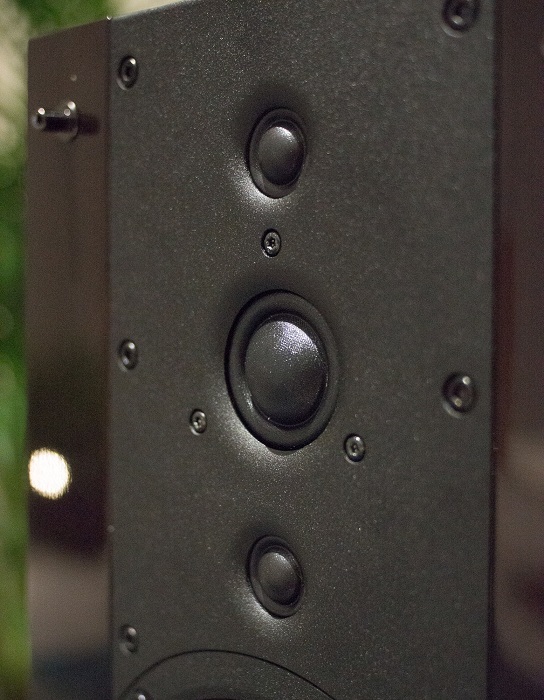 The speakers incorporate WD super tweeters designed to reproduce the exceptional sound of hi-resolution audio. We look forward to seeing you at the end of November. 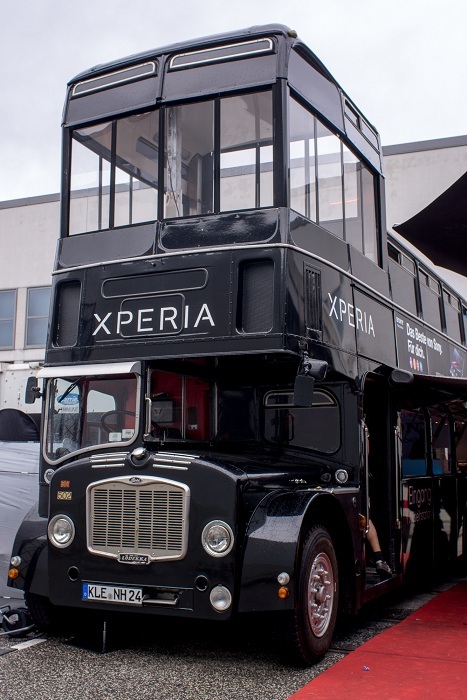 Audio T & Sony Go To IFA Berlin. 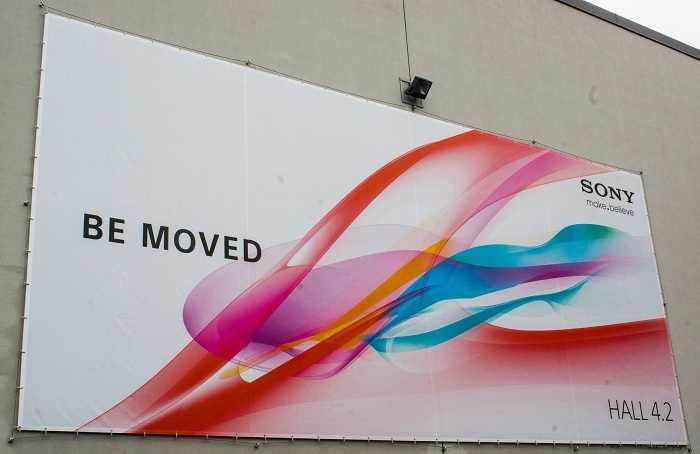 As many of you may already know, one of the worlds largest consumer electronics shows took place in Berlin,Germany. Sony very kindly offered to take myself (Munir) and Gavin from our Manchester and Preston stores to the Sony stand at IFA Berlin. 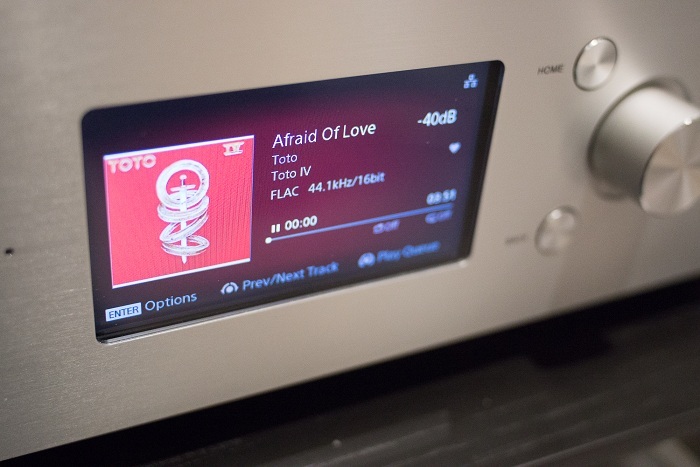 We were shown a range of high end hifi products from Sony's now legendary ES range and the latest 4K home cinema projectors and TV's from Sony. Here's a quick diary of our day at the show. ...and were promptly whisked away to the inner sanctum. Eric Kingdon from Sony UK was on hand to give us a brief overview of the upcoming delights from Sony. Starting with reference speakers from Sony. The SS-NA2ES from Sony use custom designed drive units made by Scan-Speak. 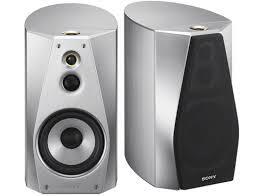 Sony's innovative I-Array tweeter system. Superlative design and cracking build quality is used in the cabinet design. 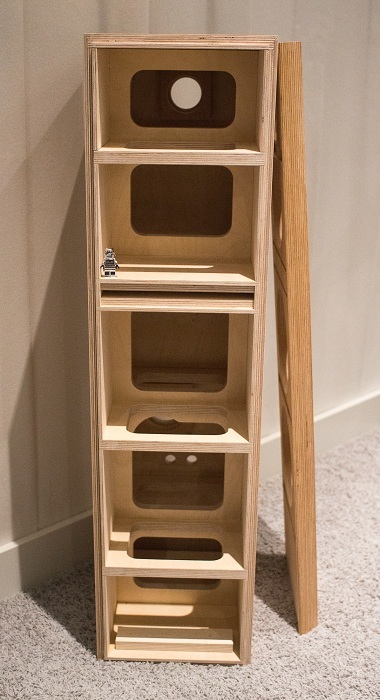 The baffle on the SS-NA2ES cabinet is made of Scandinavian birch ply-wood. 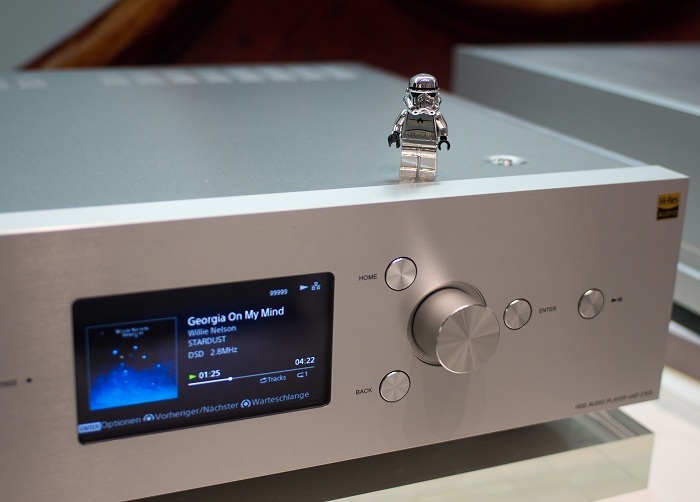 The new range of ES Hifi streaming products certainly caught our attention. 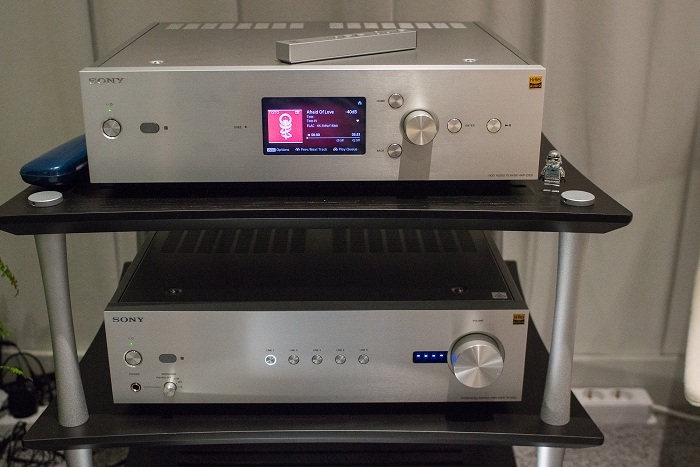 The HAP-Z1ES – HDD Audio Player and the TA-A1ES 2 channel amplifier. The TA-A1ES is the first 2-channel analogue amp Sony has developed since the TA-FA777ES, 14 years ago. The decision was taken to create an analogue 2-channel separate amp (not digital) in order to provide the best sound quality possible. I quite like the size of those binding posts, easily accommodating chunky speaker cable like the Chord Epic or Chord Sarum. All controlled from a beautifully sleek remote. The HAP-Z1ES from Sony has a range of extra features which establish the device as the highest quality audio player made by Sony. Music that is stored on a PC can be copied over the network onto the integrated 1TB HDD (this HDD is expandable via a USB socket on the back of the product). It can be controlled with a free app for Android or iOS. The HAP-Z1ES includes the unique Sony technology ‘DSD Re-mastering Engine’ this technology upscales all standard music files (MP3, AAC, WMV) into DSD files. This results in stunning Hi-Res Audio quality from your entire music collection. It includes a digital-to-analogue converter (analogue FIR filter) to reduce high frequency noise in DSD signals. FIR filters are ideal for D/A conversion of DSD signals. The Sony HAP-S1 all in one network player seems to tick all the right boxes. With ES build quality thrown in, this product could seriously mix it up with other high end brands. Here's a quick overview of the specs. And now into the wonderful world of 4K. The amazing 4K 84 inch KD-84X9005. The new FDR-AX1 4K Handycam. This'll make your home videos look spectacular. 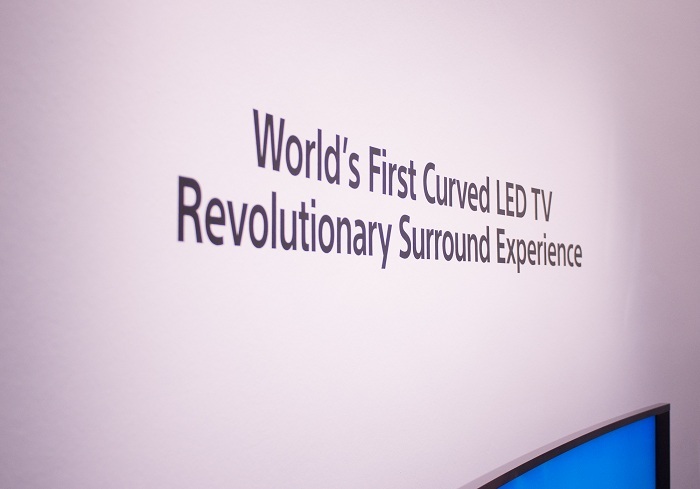 Yep...that's a curved screen. Quite clever actually. Looks like the bods at Sony have been working overtime. 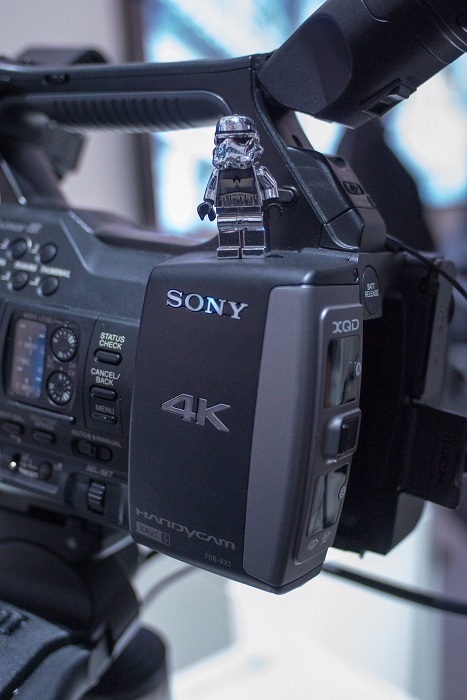 We all know how good Sony's video projectors are, so you can image our anticipation at seeing one projecting in 4K. The all new Sony 4K VW500. Sony had a projection room set up for visitors to pop in to and take a peek at 4K projection, I kid you not, it was spectacular!! standard and is much higher than the earlier 24p. The result is a smoother image with superior colour and realism. 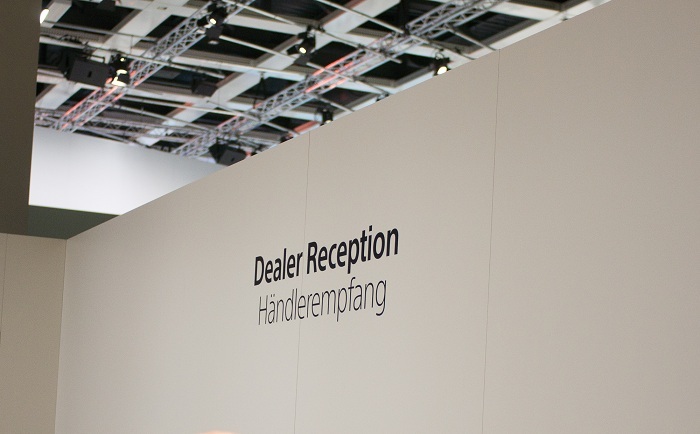 Drawing on optical technology developed for the VPL-VW1000ES, Sony have achieved both high brightness (1,700 ANSI lumens) and high contrast (200,000:1 dynamic contrast ratio) in the VPL-VW500ES. 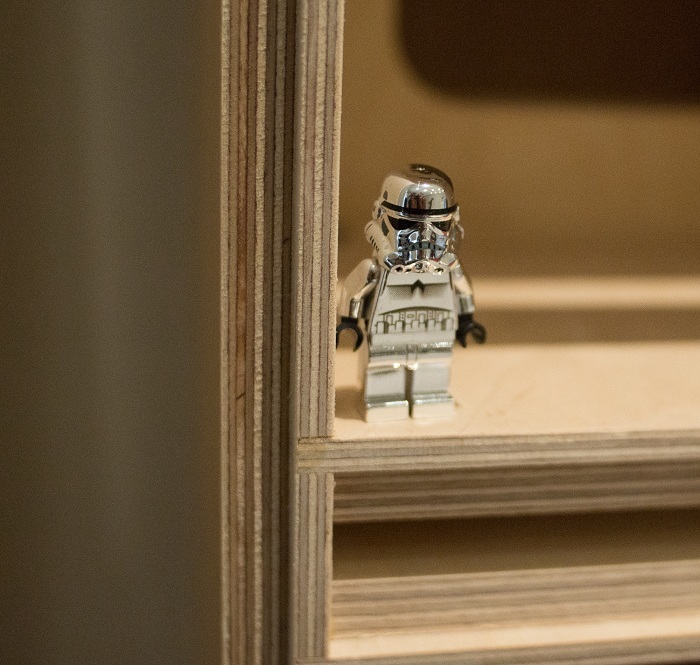 So, you’ll see crystal-clear, bright, detail-packed images – even in well-lit rooms. You'll go blind standing there Chromey!! At Audio-T Manchester, we plan to demonstrate the Sony VPL-VW500 ES at some point before the end of the year. We are hoping to get our hands on a VPL-VW500ES and make a day of it. Keep an eye on our blogs for any updates. The Sony portable audio area. 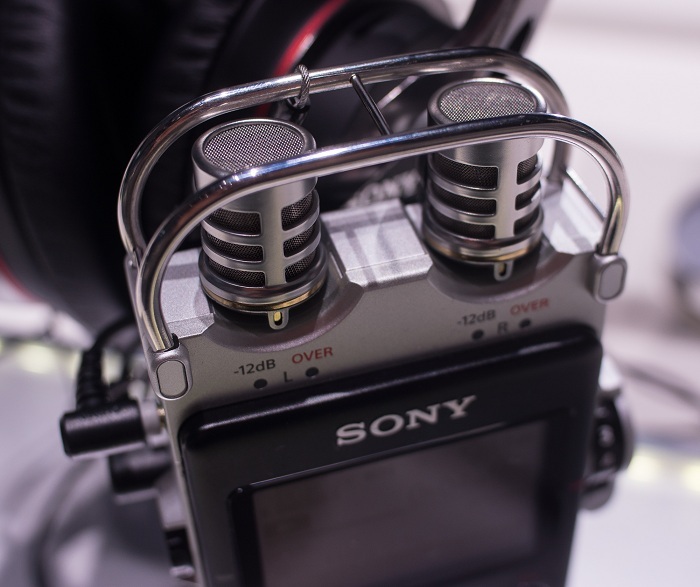 Sony also wanted to show off the new portable linear PCM audio recorder, which can also read Hi-Res DSD files. It looks like a pretty serious piece of kit. I want one!! Our last stop came at the home cinema area where Sony were showing off the worlds slimmest Sound Bar? As you can see the claim is real but does it sound any good. Sony invited us to the dealer area again, away from the crowds and let us listen to the new HT-ST3 sound bar in a quieter room. ...but with one exception. Look how slim it is!! It's shorter than Chromey. Even Chromey was feeling quite smug. He looks positively gargantuan compared to the HT-ST3. Ok little guy...ahem! big guy. It's time to go..
As we were leaving, even the staff on Sony stand had to say goodbye to Chromey. Right then Chromey!! Your chariot awaits you, and British built as well. You can drive. Pictures and some of the words by Munir. Contact details for Audio T Manchester. For those who came to our Classic Album Evening and even for those who didn't. In fact for any and all Pink Floyd fans out there. Tune into BBC R2 or R6 on Monday at 8:00pm as Tom Robinson invites listeners to compile The Ultimate Pink Floyd Playlist. See the link for details. Followed by Darkside , a play for radio by Sir Tom Stoppard incorporating The Dark Side of the Moon by Pink Floyd. It sounds like a good evening of listening. We have now taken delivery of the new Sony KD55X9005 4K Television. 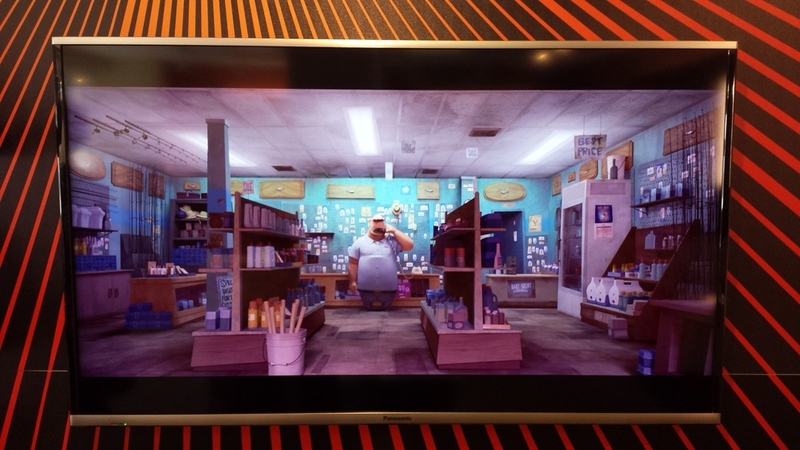 As you can see from the photo below we have wall mounted it in a prime location in the store for you all to be amazed at the image this TV is capable of. Currently we are using a hard drive to stream content to the set. 4K Blu-Ray discs are on the way. 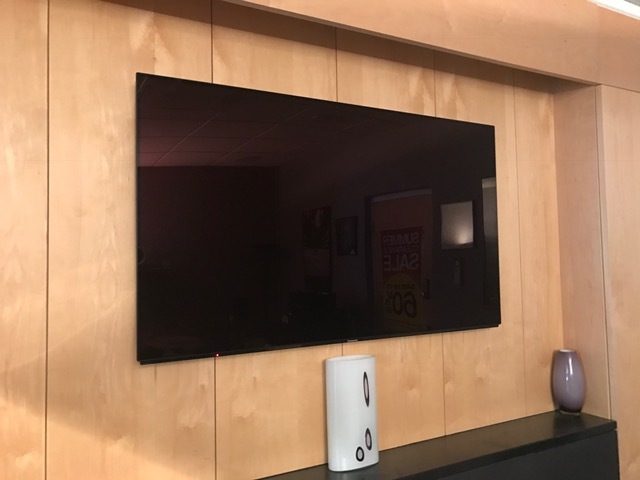 Not only does this TV offer outstanding picture quality but with the use of magnetic fluid loudspeakers developed by NASA the sound quality achieved by this TV is truly incredible. The links below will take you directly to Sonys promotional video and the dedicated web page for the Sony KD55X9005 so you can see the full specifications of this outstanding TV. Please feel free to come into the store so you can see the future of TV. 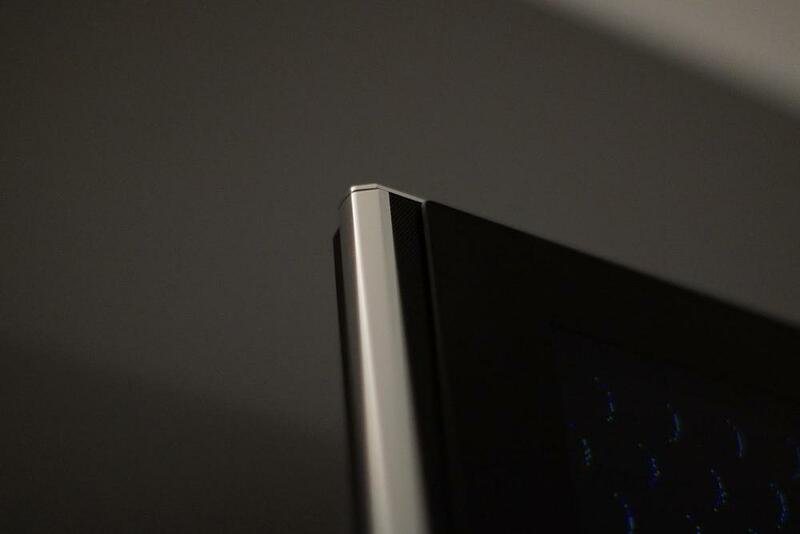 Sony KDL55W905 55'' LED TV, The best TV since the Kuro? Here at Reading Audio T we've always believed in having the very best TV available and I mean that in the singular. We don't have the space for a whole lot of TVs, we never have had so we are keen to show our discerning customers the very best technology can offer and this season is no exception. The Sony KDL55W905 is the flagship of their range after the 4K TV, indeed it has the same if not better picture than that for 1080p content which of course if the highest native resolution available at present of course. With a few minor tweaks to the settings this TV gives the best non-calibrated picture we've ever seen with the deepest blacks and accurate colours from an LCD yet, yes you get the fantastic '3D pop' like the best plasmas. By that I mean depth of field rather than full 3D with glasses which it also does superbly well AND has 4 pairs of lightweight comfortable active glasses included, bravo Sony! !